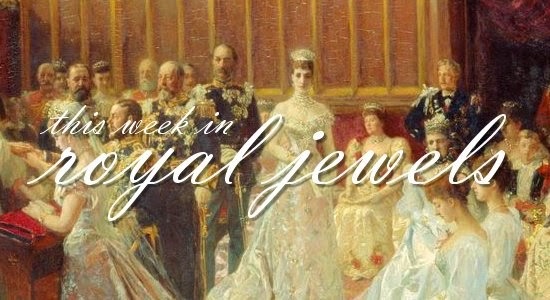 Earrings, necklaces, brooches, and one very glittering princess on the docket this week. Vote for your favorite in the poll below! 10. The Duchess of Cambridge -- or, I should say, the Countess of Strathearn -- was in Edinburgh for a series of engagements on Wednesday. She wore her Kiki McDonough Lauren earrings for the day. 9. We got a tiny glimpse of Princess Sofia's earrings at the Royal Swedish Academy of Fine Arts on Friday -- looks like small round pearl drops, perhaps? 7. The Duchess of Cornwall selected her pearls with the diamond and sapphire deco clasp for a trip to a library in Islington on Wednesday; she's also wearing golden earrings instead of her usual pearl and diamond pair. 6. Camilla wore her usual daytime earrings with one of her sparkliest pearl-and-clasp necklaces to visit a London school on Tuesday. 4. Here's a royal we don't see that much of: Lea, widow of the late Prince Alexandre of Belgium (who was a younger half-brother to King Baudouin, King Albert II, and Grand Duchess Josephine-Charlotte). She wore a lovely pair of glittering earrings (and maybe also a jeweled brooch?) at a charity gala in Switzerland on Saturday. 3. Queen Elizabeth II wore a major royal heirloom on Thursday at an audience with the High Commissioner of Grenada at Buckingham Palace: the brooch from Queen Victoria's collection that is studded with eleven pearls. 2. Crossrail in London was re-christened the "Elizabeth Line" on Tuesday, and the Queen was there in bright purple and her amethyst bouquet brooch to mark the occasion. 1. My unreserved vote for best jewels of the week goes to Princess Madeleine of Sweden, who wore her Nobel 2015 jewels and gown on Monday at the palace in Stockholm. The occasion? A tea party for Swedish children dealing with medical issues, sponsored by Min Stora Dag (a Swedish organization similar to the Make-a-Wish Foundation -- Madeleine is its patron). Any excuse to see the stunning aquamarine kokoshnik (and a pair of gorgeous aquamarine earrings!) 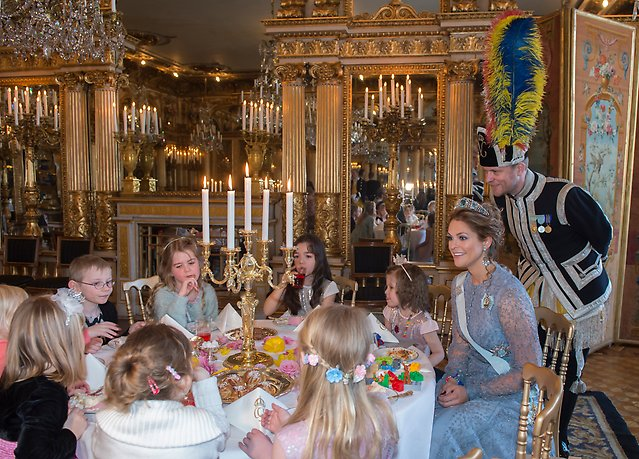 is worth it in my book, but a fairytale tea party for deserving kids, complete with an actual tiara-clad princess? SO GOOD.